We are happy to offer you a wide range of rental apartments, from standard to deluxe, located in the very heart of our beautiful city within walking distance to restaurants & supermarkets, museums & art galleries, night clubs & cafes. As people with extensive experience in apartment rental services we will make your stay comfortable and enjoyable, so you get the most from this fascinating Ukrainian city. Many travelers consider rental apartments for visiting Odessa as a way to save money. 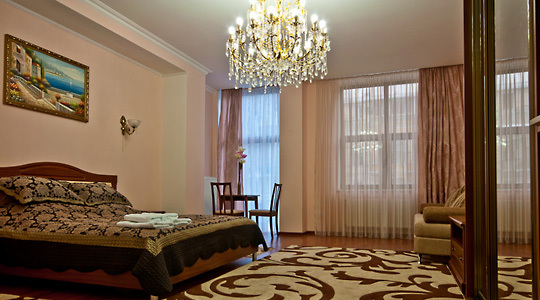 In many cases apartments in Odessa accommodate more guests than a hotel room. When you rent an apartment you can cook for yourself, instead of eating out for every meal. Some travelers like the feeling of “living” in the city they are visiting. A rental apartment gives you a sense of living in Odessa, instead of just visiting it. How to book accommodation in Odessa? To rent apartment in Odessa please pay attention to the description of it, along with its location in the city map, which is included for each rental accommodation we offer. Next step would be to contact our apartment rental service via e-mail (just click reserve button and complete the reservation form) or by phone, indicating the apartment name or ID #, the date of the arrival and departure. Our manager will contact you ASAP to confirm the availability of the rental flat for the dates you request. The booking confirmation would be done after receiving a (nonrefundable) deposit for 1 night stay. The deposit may be paid with Visa/Master Card or by sending the required amount via Western Union or Money Gram. The balance is required to be paid upon your arrival. How to get to my flat? For your convenience we offer airport/train/bus station pick up, so inform us beforehand to make the necessary arrangements. Our driver would meet you at Odessa airport hall holding the sign with your name on it, and take you to your Odessa apartment. For different reasons most foreigners travelling to Ukraine for the first time, experience a culture shock for the first couple of days. By ordering the service you will be able to feel relaxed right from the start, instead of feeling lost at the airport and then overcharged by airport taxi drivers. Rent accommodation in Odessa on a short notice. Our present life is full of surprises. If you happen to arrive in Odessa without a rental apartment arranged, feel free to contact us and we will try to provide you with the most suitable apartment for daily rent on a short notice. Check in time in our apartments for rent is 14:00 and check out is at 12:00, (check with us for the availability of early check in and late check out, if needed). Changing Dates Policy: If you change your plans at least 8 days prior to your scheduled arrival, your booking deposit will be put on hold until your next arrival date. Qualified Translators and Interpreters will be available per your request for $ 12 -$ 15 per hour, depending on the duration of the requested service. He/she will also assist you in the best possible way with solving any difficulties you might face, escorting you, or showing you around. to travel within Ukraine, we would happily arrange the service. Public transportation is not that comfortable in Ukraine, so the suggested service is a way to travel safely and comfortably enjoying sightseeing. The service is available upon request and on short notice. For your convenience, we will also assist you with purchasing air/train/bus tickets and arrange additional services in other cities in Ukraine. Although you will find cleaning material in your apartment, the cleaning service every 4 days will make your stay more relaxing and save you time. The service is free of charge and preformed at a time that is convenient for you.